There were 10 riders within 30 seconds of the race lead at the start of the day. On the most mountainous stage of the race – over 4,000 meters of climbing – it wasn’t going to finish like that. Sure enough, there was a shake-up, provoked by a bold ride from new race leader Christophe Riblon of Ag2r La Mondiale. Perched on the edge of the podium platform, an Ag2r soigneur ready with dry kit and obligatory baseball cap, Riblon shook his head in disbelief, as though unable to take in what he had just done. “This is the sort of level that I’ve been trying to find for years,” he beamed, “and I’m making the best of it.” And it was gut feeling and a gamble that propelled Riblon out of the 12 man lead group (effectively the peloton) which contained the favourites and race leader Jon Izaguirre (Euskaltel). There is no power measuring device on Riblon’s Focus Izalco bike, he was winging it, it was all or nothing with 12 kilometres and another uncategorised climb to the line to go. At this point in the 10-climb stage, there were two riders out in front, Atapuma and Sergei Chernetsky (Katusha), who had a 15 second lead over a chasing group of seven riders who the lad duo had attacked. It was a hard, hot and messy day, with riders yo-yoing on and off two big groups which formed early on. Today the early ‘break’ contained no fewer than 32 riders, while the favourites and race leader stayed in a peloton that got progressively smaller as the climbs kept on coming. 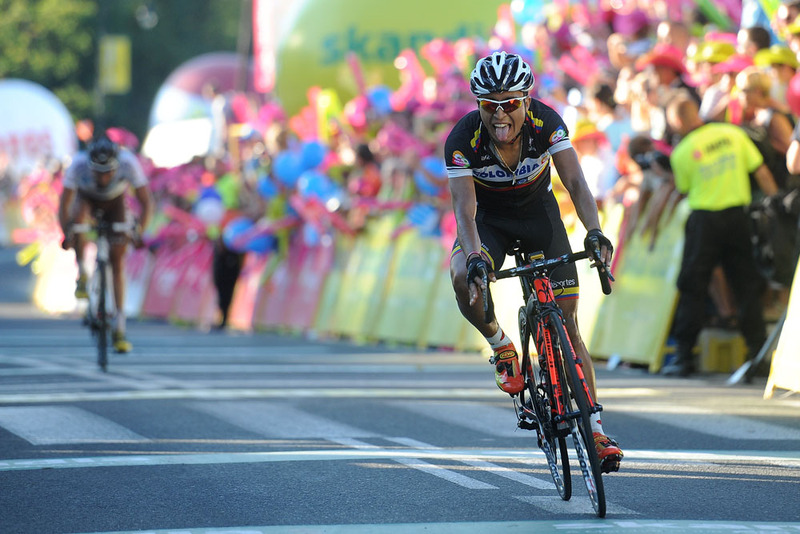 As the stage wore on, both groups thinned out, as Euskaltel and SaxoBank rode at the front of the bunch, keeping the break within three minutes for most of the stage. Santaromita, who had looked strong throughout, attacked and took Kiserlovski and NetApp Endura ‘local’ (he’s Czech) Konig with him and they are not hanging about with 23km to go. Chased by Howes, Atapuma and Golas, they joined up and got straight down to it as behind Cannondale rode for Ivan Basso with no fewer than five of the team still in the ‘peloton’ with 15km to go. And it was having an effect as the break only had 1-05 left to juggle with. Finally, with 13km to go, the stage winning move came, with Atapuma jumping out of the lead group, joined by Chernetsky. 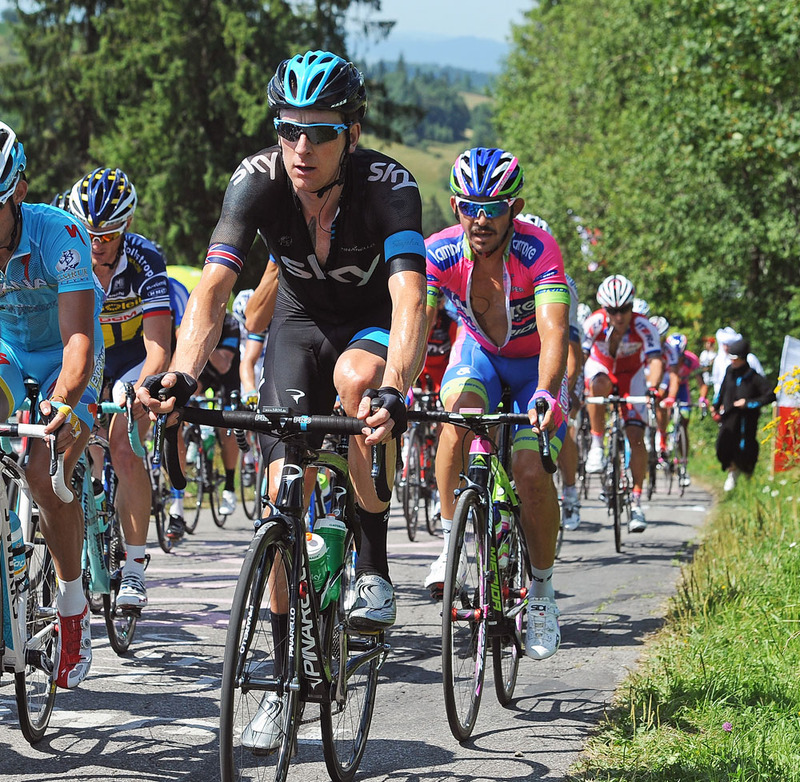 Behind, with the favourites, Riblon attacked just before the summit of the final prime at 12km to go. The bunch was now only 13 riders and nobody appeared to be taking Riblon’s move seriously. Any chase that might have come from the erstwhile race leader and local man most likely to Rafal Majka was stymied when he crashed on a left hander, pushed on by a bloke with a Polish flag before the chief commissaire had passed him. He ended the day the leading Pole, but, on the podium, he looked to be fighting back tears. This was surely not the finale he had in mind. Riblon caught the front group and went to the front straight away. There was no dithering from the Frenchman. “When I got up to the Kiserlovski group I really wasn’t sure if I would be able to drop them on the final climb, so I asked Kiserlovski, who had been going well, to give me a turn at the front, because I didn’t want them to attack me but they obviously couldn’t,” laughed the 32 year old Frenchman with a air of disbelief in his voice. So he attacked again. The leading pair were still around 15 seconds up the road and there were four kilometres to the line as Riblon rode away in pursuit. At 2.2km to go, as they were on the point of being caught by Riblon, Atapuma attacked, dropping Chernetsky, but he was unable to deter the Terminator in the Ag2r kit. With 1.7km Riblon caught the Colombian and, once again, went to the front before turning and asking him for help. None came. “I asked him to give me some help, I told him ‘You’re going to win, you’re going to win! I will finish second, that he could take the stage, no problem. If he had helped it might have got me another four or five seconds, but he didn’t want to…”. Indeed, help came there none and, inside the final 100 meters, Atapuma jumped past Riblon and put two seconds into him. 20 seconds after that, Konig led over the race favourites. When the dust had settled and time gaps calculated, the stage left Riblon in the race lead with a 19 second gap back to Izaguirre, 20 seconds to Majka and 24 seconds to Henao. “We’ll see how it goes tomorrow (in the 37km time trial) but with the legs I have at the moment? It’s not bad!” concluded Riblon as he was ushered away for his race leader’s yellow jersey. Riblon hasn’t done much in time trials, though he does have some ‘previous,’ finishing on the podium in the French Espoirs time trial championship and winning French pursuit titles. With his current form and motivation, who knows? But while Riblon and his fellow non-specialists are fighting it out for the general classification, there’s another trio who have their eyes fixed on big performances tomorrow. 27 minutes after Riblon had enjoyed a couple of slugs of Champagne and kiss from the girls, Bradley Wiggins and Fabian Cancellara crossed the finish line, barely glancing at the podium as they headed for their team buses. A further 13 minutes after that, Taylor Phinney rolled in, having opted to fit a compact chainset to save his legs for tomorrow. Riblon might ultimately run out as race winner, but tomorrow’s final stage surely belongs to one of those three.